The Airflo Ridge Lines introduced a new concept to fly lines. That concept was to run ridges down the length of the entire line to reduce friction in the guides of the rod and help the line shoot. The ridges are hardly noticeable when you are looking for them... but you will definitely feel the difference on your first cast. The shootability of the Ridge Lines is outstanding and we've been very impressed with this line for durability, floatability, overall performance. If you're looking for something new in a fly line, give the Airflo Ridge Supple Tactical line a shot and you may find yourself joining the growing number of fans of these lines. Weight forward taper. Peach color. Floating line with a loop welded onto both ends of the line for easily connecting to your backing and adding your leaders. Utilising the Tactical taper developed by Rene' Harrop, the Ridge Supple Technology improves the original beyond belief in cold conditions, making the line more supple in the hand and more importantly, this suppleness allows the flyline to follow the waters surface more effectively to help reduce drag and help you catch more fish. Casting is improved in cooler temperatures with a coating that flexes easily, helping maintain ultra sharp loops and smoother casts. With the ultra low frictions Ridged surface and low stretch power core, the line generates incredible line speed to put your fly in the zone regardless of conditions. Ridge Tactical is still available with the original coating in pale peach for those who prefer a stiffer line. 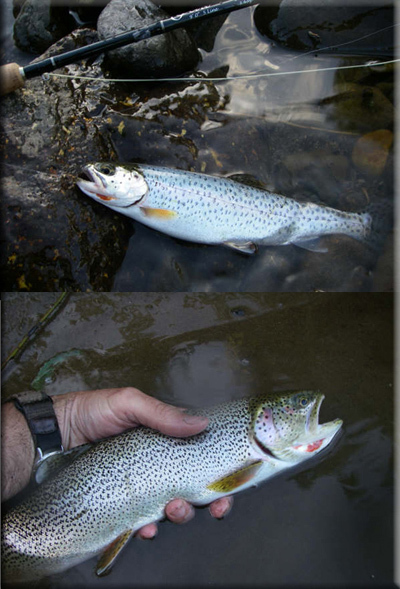 Caught using "Airflo - Ridge Tactical Trout Flyline"